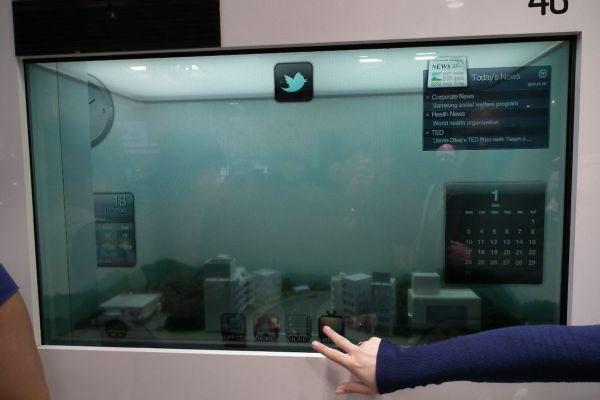 Samsung Electronics Co. Ltd. announced that it began mass production of a 22-inch transparent LCD panel in March this year.Transparent displays will have a wide range of use in all industry areas as an efficient tool for delivering information and communication. With the world’s first mass production of the transparent LCD panel, Samsung Electronics plans to lead the global transparent LCD market by developing various applications.The panels come in two types, the black-and-white type and the color type, and they have a contrast ratio of 500:1 with WSXGA+ (1680×1050) resolution.Compared with the conventional LCD panels that use back light unit (BLU) and have 5% transparency, Samsung‘s transparent LCD panel boasts the world’s best transparency rate of over 20% for the black-and-white type and over 15% for the color type. The transparent LCD panel has a high transparency rate, which enables a person to look right through the panel like glass, and it consumes 90% less electricity compared with a conventional LCD panel using back light unit. It’s because a transparent LCD panel utilizes ambient light such as sun light, which consequently reduces the dependency on electricity for generating power.Also, Samsung‘s transparent LCD panel maximizes convenience for not only manufacturers but also consumers by incorporating the High Definition Multimedia Interface (HDMI) and the Universal Serial Bus (USB) interface.Transparent display panels have endless possibilities as an advertising tool, which can be applied to show windows and outdoor billboards or used in showcase events. Corporations and schools can also adopt the panel as an interactive communication device, which enables information to be displayed more effectively.